How to Get Your Health Coach Website Written Already! You love helping people take charge of their health. You get energized by hopping on a call to guide them through positive nutrition and lifestyle changes. You geek out on pulling together meal plans, workouts and programs that are customized to super-charge your client’s health. Way to go! You’re an amazing health advocate! But when it comes to create a website and an online presence for your business, you feel like you’re way out of your league. Marketing terms sound like pig latin to you, and the idea of throwing together a website makes you want to run for your chocolate stash (you know, the one that’s hidden in that back corner of your pantry). I get it. I see you, you passionate health coach extraordinaire. And I know that with all the heartfelt, incredible skills you have to offer your coaching clients, you deserve a website that lets readers know in the first 10 seconds of scrolling that they’re in the right place. 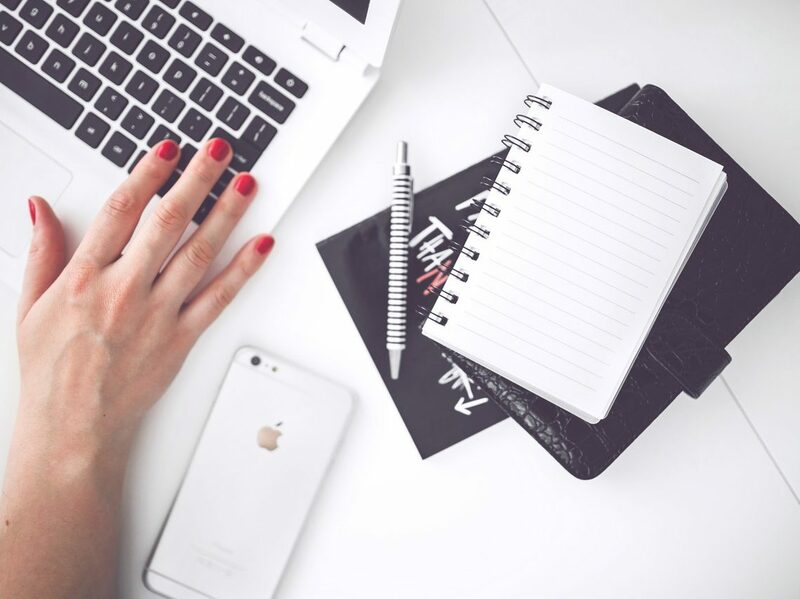 But like most entrepreneurs who lack a marketing background, you’ve probably felt stuck when it comes to writing compelling marketing material that sells your services for you (and yes, your website is a piece of marketing material!). You’ve hit the brick wall while trying to write your website. You know the wall I’m talking about, don’t you? What you need is a simple system to guide you through the process of writing your website copy. A system that you can use over and over again to write any form of advertising you need, from a social media post, to a blog, email campaign, and more! I’d like to share with you my simple copywriting strategy that I use for my 1-on-1 clients to write a website that converts. 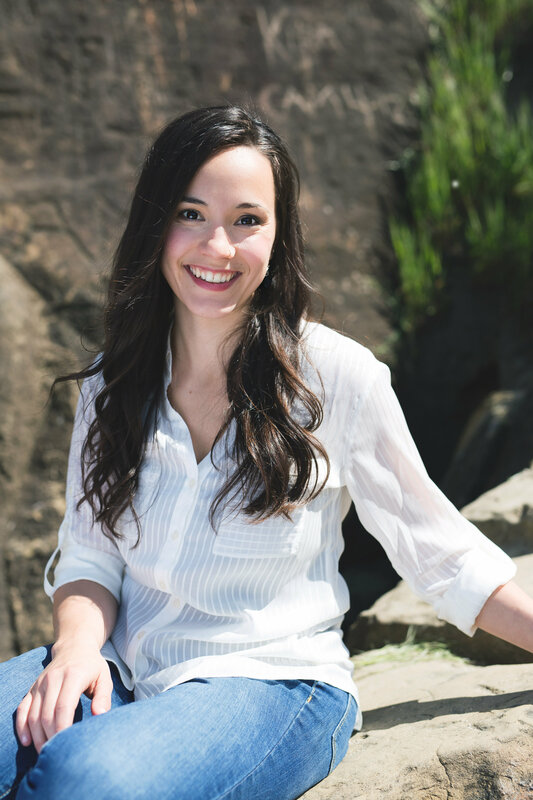 I’m Margo, and I’m a massage therapist who turned my knowledge of the wellness industry into a second career as a copywriter for wellness business owners. I help massage therapists, health coaches and other small businesses launch authentic, profitable websites and I’m here to share with you the lessons I’ve learned along the way. I used to be just like you—I adored working directly with my clients but felt like marketing just wasn’t my thing. But when I began to study the proven techniques of copywriting, I came to understand that good marketing is really just a matter of authentically positioning your services in front of an audience that already wants to purchase them. And once I began writing website copy for wellness professionals, I was hooked. So stick with me to the end of the article and see if you feel a little lighter, and less “Ew gross I hate sounding sales-y” about writing your website. What in the world “copywriting” is, and a simple method to apply the techniques of copywriting to your website in a step-by-step way. The common mistakes that I see newbies making when writing their websites, and how to avoid them in your own writing. Now let’s get started with a few basic terms you’ll need to understand. FYI – at the end of the article I’m sharing a free resource that I created to help you put these tips into practice, so read all the way to the end! What Is Copywriting And Why Should I Care? In the case of your website, we would refer to any and all text that you’ve written on the pages of your website as website copy. Copywriting, then, is the process of writing text used specifically for marketing purposes. The reason why you should care about copywriting is that it is what separates the effective marketing campaigns from the ambiguous ones. What (service/product) does this person offer? If they can’t answer those simple questions, it’s time to go back to square one and look at how you’re communicating to them with your website copy. Search Engine Optimization (SEO), which is any activity that’s intended to improve ranking on search engines such as Google. And last but not least is Call to Action (CTA), which refers to any device used to encourage immediate action by a website visitor, like a “Book a Free Consultation Call” button. Alright, now let’s get this copywriting party started, shall we!? My Simple 5-step Process For Writing Your Health Coach Website – even if you hate writing! When a client hires me to write their website copy for them, I don’t just read what they already have, do a little brainstorming, and then re-write it in a way I think sounds good. I used a carefully created system, based off of proven marketing techniques, to create a website that makes their message crystal clear to visitors from the Home Page to the Contact Page. I want to share that system with you right here. Go ahead, swipe my system! You can thank me later. The copywriting process has to begin with the answer to the third of those three questions I just shared with you: Who is this service/product for? You might think this is backwards, because after all aren’t we writing about your services and products, so shouldn’t we start from there? But the hard truth is that your products are nothing without an audience to deliver them to. I know you want to help people, so we have to figure out exactly who you’re going to help in order to do that. You’re going to create a target client profile (also called an ideal client avatar), and include as much detail as possible. This might not be YOUR audience, but you get the idea. Go sit down with a paper and pen, and start writing all the different components that make up your ideal client, until you’ve settled on the profile that works for you. Now you’re going to go out and find your target client where they already are, whether that means a sample group of your own previous clients, or a sample of potential clients that fit the profile you created – if you’re just starting out and have no previous clientele yet. If you have a client base, take the time to do 5-8 Skype calls with clients and interview them about what their pain points were when they came to you for help, what about you attracted them or seemed different than other health coaches out there, and what transformation they experienced as a result of your approach. If you don’t have any clients of your own yet, go look for people who match your ideal client profile where they already spend time online. Then you’re going to record everything you learn about the struggles and desires of your ideal client for use in the next step. Here is where you’re actually going to assemble your content into what looks like website copy, rather than a series of quotes from your target client research. You’re going to start with an outline, which will include your Home page, About page (or Start Here page), Services page, Contact page, etc., and then within that outline you’ll have a subsection for each part of the page, including Headlines, Sub-headlines, Body Text, Bullet Points, and so on. Use as much of what you learned from your target client research as possible when writing this copy. This is how you’ll make your reader feel like you “got inside their head” and truly understand who they are, what they need, and how to deliver it in a way that’s perfect for them. I’ll talk more about this below in the common mistakes, but this is SUCH an important step in the writing process, yet it’s one that is skimmed over much of the time. Whether you need to hire someone to look everything over for you after you’re done, have a couple friends take a look, or you’re able to do the editing yourself, make the time for it! You won’t regret it. Test every link, make sure your thoughts flow from one to the next, treat your business like the amazing brand that it is and make sure that you take the time to polish your copy after it’s written. Woohoo! You made it to the launch! It’s time to send your website copy out into the world and see how it’s received! It will take a few weeks to test the waters, monitor your analytics, and see what’s working and what’s not. Maybe you notice that nobody’s clicking over to your Services page—alright, now we know we need a better CTA directing them there. Perhaps you find out people aren’t scrolling all the way through the Home page, great, now we just need to trim down the copy so there’s less for them to read through. Don’t feel like your website copy is set in stone once it’s launched. This is YOUR website, not a published dissertation. You’ve absolutely got room to grow, edit, change and improve it as often as you need to. Pssst! Grab this FREE RESOURCE to help you put this five-step system into practice! 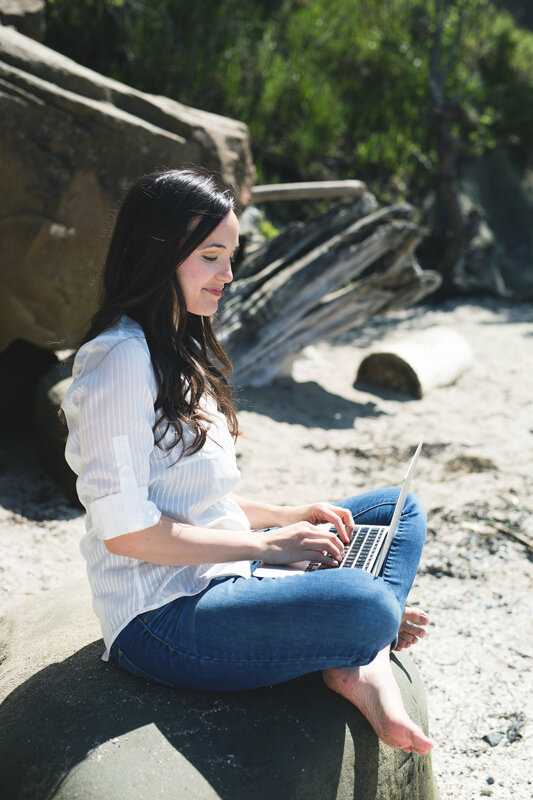 And if you still need more help writing your website, I’ve created a free, beginner-friendly email course called WELLNESS WEBSITES 101 for you so you can put all this into practice. Margo Carroll, copywriter at Remedy Writing, also runs the show as a Wellness Brand Strategist at Your Wellness Website Blueprint. When she’s not writing valuable articles such as this one, she enjoys trail running, spending time with family, and a piping hot mug of tea. Be sure to connect with Margo on Facebook or you can ogle her lovely Instagram feed – you’ll quickly see why we got connected!